In what comes as a big boost to 'Make in India', Xiaomi has announced a new manufacturing plant in Tamil Nadu, making it the company`s seventh such plant in the country. The company claims that 99 per cent of smartphones sold locally are made in India. Source - Xiaomi India/ Twitter. In what comes as a big boost to 'Make in India', Xiaomi has announced a new manufacturing plant in Tamil Nadu, making it the company`s seventh such plant in the country. The plant will be launched in partnership with Flex Ltd and will span over 1 million square ft. The plant will be located in Tamil Nadu and will boost Xiaomi's capability to produce up to three smartphones per second during operating hours, from two at the moment. With this, Xiaomi has seven manufacturing plants across four campuses in partnership with FOXCONN, Flex and Hipad. 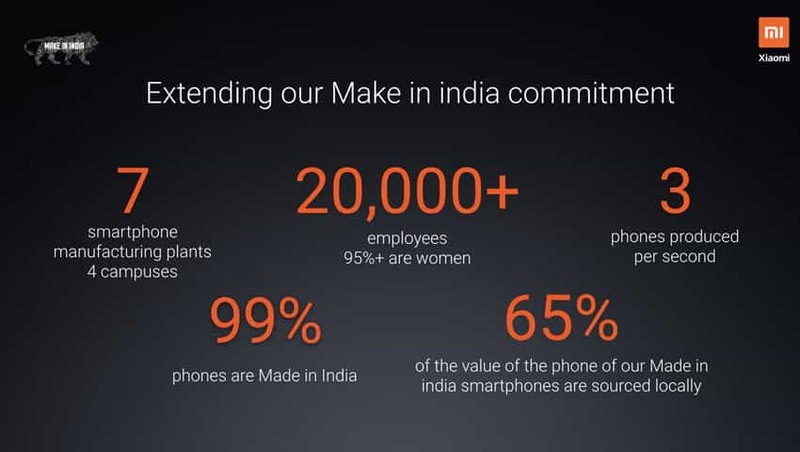 The company claims that 99 per cent of smartphones sold locally are made in India. It claims to employ more than 20,000 operators across seven smartphone manufacturing plants. Interestingly, 95 per cent of these employees are women. In addition, even smartphone chargers, USB cables and batteries are nearly 100% locally sourced. The company has also partnered with Navitasys India Private Limited, a TDK group subsidiary to manufacture Mi Power banks locally. Announcing the new plant, Muralikrishnan B, Chief Operating Officer, Xiaomi India, said, "We are also delighted to announce our new smartphone manufacturing partnership with Flex Ltd. In line with our sincere commitment to Make in India, this new association will further drive our localization efforts; ensuring that we locally design and offer our innovative products with the best specs of the highest quality to our Mi Fans in India." With our association with Foxconn, Hipad and now @flexintl, we have been able to generate over 20,000 jobs at our smartphone manufacturing plants in the country. Xiaomi also launched its UPI-based application Mi Pay. Using this app, Xiaomi users can make payments using UPI and other debit cards, credit cards and internet banking across 120+ banks and over 120 billers. The app has been approved by NPCI under the multi-bank API model and it has been audited by CERT-IN empanelled auditors E&Y and Lucideus. "At Xiaomi, our efforts are consistently driven by our core philosophy - innovation for everyone. With this belief at heart, we have introduced our innovative Mi Pay service for our consumers in India. Mi Pay serves as the ultimate solution to a variety of consumer payment needs, hence empowering millions of Xiaomi users with access to digital payments. Thus, acting as an equalizer providing a seamless experience across all smartphones," Muralikrishnan added.